Full sized headphones are popular again and the Bluelounge Posto headphone is the ideal resting place for your headphones when they is not in use. It has a flexible rubber headrest that easily confirms to the design of all kinds of headphones, whether they are small or large. Though it consists of three separate pieces including the thick plastic base, a metallic central elevating bar and a rubber headphone holder, the stand is easy to assemble. It is available in either white or black to go with the décor in your office or home. The stand is very lightweight but it also comes with four microsuction pads on the bottom to keep it in place. The stand has robust build quality and the micro suction adhesive of the sticky feet works really well. The central bar is made of aluminum, so the stand can support even the heaviest headphones. The only drawback with the stand that there is no scope for repeated disassembly. You can assemble it only one time. 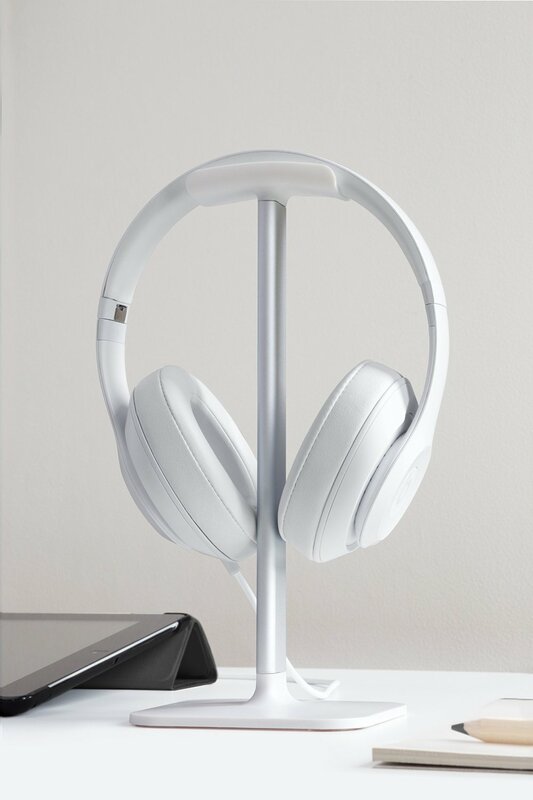 The Bluelounge Posto headphone stand is a well designed product that provides you with a neat way to keep your headphone on your desk and off the ground. You will definitely enjoy your headphones for a longer time, if they fall on the ground less often.